Hi, everyone! Welcome to my next installment in Linda Coughlin's The Twelve Tags of Christmas Funkie Junkie Style. If you click on the link it will take you to the explanation of this great challenge and all the rules. It's sponsored by Linda's wonderful boutique, The Funkie Junkie, which you should really check out if you haven't already! Okay, so on to my project for this go round. I'm up to week 5 and I was thrilled when I saw Linda's tag for this week. (She's up to week 8, by the way)! It was very Art Deco. Anyone who knows me or has followed the blog knows that I LOVE anything Art Deco. 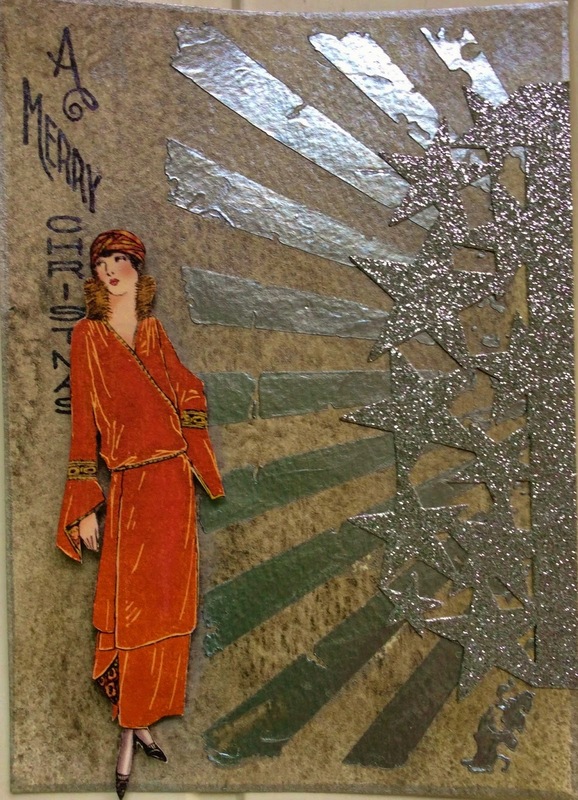 When Tim Holtz came out with his Deco Christmas stamp set last year I was thrilled!! I've used those stamps so many times in creating Christmas tags and paper art. Well, once again, I put them to good use. Here is what I came up with. I used Linda's design liberally in this page. I loved the star border with the sun rays stencil. It really looks very Deco. 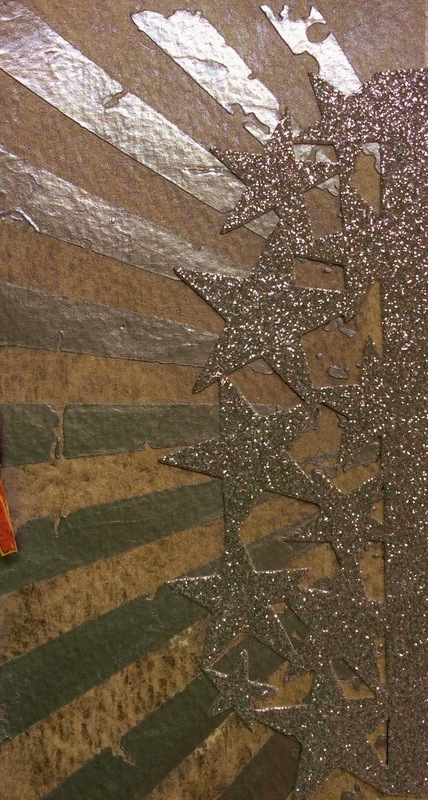 So, I cut the stars with a silver glitter card stock and glued it on top of the sun rays which I had stenciled with Wendy Vecchi's silver embossing paste. The background was done with Distress Stain and some Perfect Pearls spray. I stamped the Merry Christmas with a stamp from the Deco Christmas stamp set with black archival ink and ran the silver DS around the edge of the page. I don't have the deco gentleman die that Linda used. So, I found a lovely flapper dressed in red and ready to go to a holiday party in the Graphic 45 Couture collection of papers. I fussy cut her and applied her to the page with foam tape. Here are some details. I love my Art Deco page! It was so much fun to plan and when I found the flapper in her red costume I was thrilled! Sensational, Maryanne! Your twist with using the flapper instead of the gentlemen is so fun - she is gorgeous and I love the red. Your glittery stars and rays look wonderful. So happy to see another entry from you. Thanks for playing along. I love the Art Deco period, too. Symmetry and geometric lines can actually make me swoon (I truly believe I was born in the wrong era!!). This tag is my favorite so far...the silver rays are perfect! WOW, Maryanne! What a wonderful art deco piece! I love the stars and the cool rays, but especially love the beautiful flapper! This tag is absolutely gorgeous! And I also want to thank you for your visit to my blog! I always enjoy your visits so much! Your kind words are really appreciated! Happy Thanksgiving to you and your family, my friend! HUGS!!!!! Art Deco is always my first love when it comes to jewelry and fashion and visuals. Eventually, other influences seeped in, but Art Deco gets my heart beating a bit faster. This tag is perfect! Her red elegance, the slanted font, the broken linear rays, GLITTER stars! and the understated colors of it all ~ really beautiful tag, Maryanne! Gorgeous! You've really captured the Art Deco style here, and that wonderful red dress gives the whole thing a Christmassy feel - just perfect. I also love the silver embossing paste!